Chris Mc Donald of Offaly in action against David Reidy and Shane O Donnell of Clare during their Allianz Hurling League Div1b Round 1 game in Cusack park. Photograph by John Kelly. 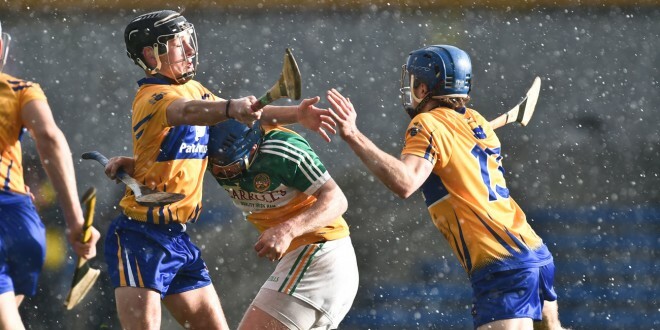 As expected, Clare made a winning start to life in division 1 B of the Allianz hurling league when they accounted for Offaly at Cusack Park this afternoon. A strong last ten minutes to the first half during which they scored 1-7 while conceding just a point laid the foundations for this comfortable win. The fact that three players were sent off might suggest that this was a dirty game but this was not the case. Fourteen minutes into the second half Peter Duggan (Clare) and Conor Doughan(Offaly) were involved in a tangle off the ball and referee Sean Cleere produced a red card for both while Offaly corner back Paddy Rigney was shown a second yellow card with just over ten minutes to go and this ended his involvement in the tie. 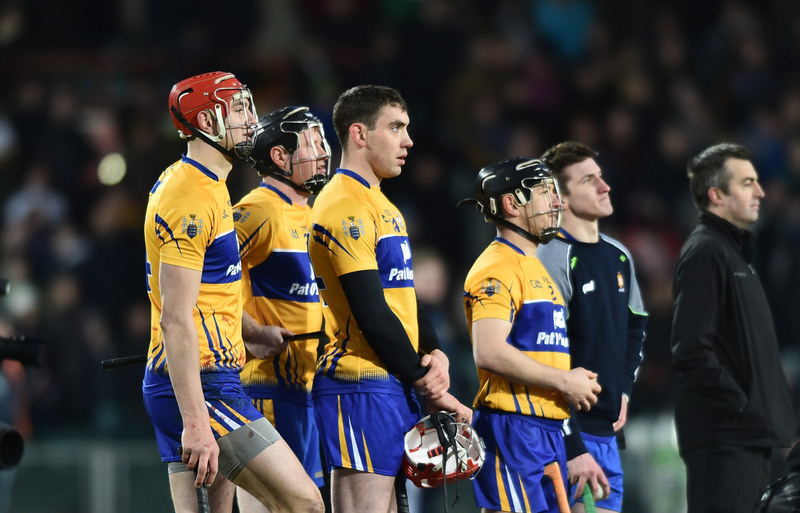 The teams were level three times in the opening quarter before the visitors edged into a two point lead, 0-6 to 0-4 as Clare struggled to get a grip on the tie. However, as the half wore on, the home side got a grip in a number of areas and they dictated matters in the final fifteen minutes of the half. Their opening goal came in the thirty fourth minute when Peter Duggan, now operating in the full forward line, burst past a couple of defenders to fire past James Dempsey in the Offaly goal. Because of a number of stoppages due to injuries in the opening half, there were four minutes of additional time during which the winners hit four points without reply to open a nine point lead at the break when the score was 1-13 to 0-7. The third quarter was evenly contested and during this period Offaly outscored the winners by a point, 0-4 to 0-3. When Shane Dooley converted a difficult free from near the sideline inside the final quarter, Offaly followers held out hope of a rally but it wasn’t to be and five unanswered points for the home side put the outcome beyond doubt. Offaly had a great chance to close the gap ten minutes from time when they were awarded a penalty but Shane Dooley’s effort was easily saved by Pat Kelly. Substitute Aron Shanagher, making his senior inter county league debut, had the final score of the day when he had his team’s second goal in he third minute of ‘injury time’.